This is a weekly series that aims to preview upcoming Regional tournaments, review Regional tournaments that have just taken place, highlight winning decks, interview players, and more. Last week's article was The Road to Worlds 2012, Week 11. Dragon's Lair (First Edition): Six players participated in Stockholm's inaugural Regional. With one deck still to be declared, there were two Federation decks, one Ferengi deck and two Kligon decks. Johan Skoglund (scox), playing a Federation deck titled "TNG Block - Fast and Simple Fed - 1E Regionals 2012", took first place after winning all three of his games. He may have been a victim of his deck though, because two of those wins were only modified. That's not surprising when 20 of his 21 personnel could be played for free, and 17 of them generated a card draw. It seems that decking yourself after five or six turns isn't always a good thing. Nicklas Lind was runner-up, playing a Ferengi deck (built by Johan) titled "TNG Block - Regionals 2012 Nicke". Daniel Lundberg (Humuhumunukunukuapua) was third, and tournament organizer Cristoffer Wiker (Smiley) was fourth. Cristoffer writes in his tournament report that he stayed up until 5am the morning of the tournament building his deck. I bet he won't do that again. Three deck lists and two tournament reports can be found on the tournament results page. Dragon's Lair (Tribbles): This Regional, originally planned for Sunday, was rescheduled to follow the First Edition Regional. It attracted eight players, two of whom had never played Tribbles before. Reigning Tribbles Swedish National Champion Torbjorn Lindquist (Linkan) lent decks to the two new players and they ended up finishing above him. He also lent decks to the two players who finished seventh and eighth, so things could have turned out very differently. As it was, Nicklas Lind took the first round with just over 100,000 Tribbles scored, but faded after that. Cristoffer Wiker (Smiley) won rounds two and three, but remained behind Nicklas in the scores. That left the door open for Johanna Lax to win rounds four and five to take the title with a total of 320,286 Tribbles scored. Johanna was one of the two players who had never played Tribbles before. The other was David Rasmusson, who finished as runner-up. Congratulations Johanna and David! Eight deck lists and two tournament reports can be found on the tournament results page. Dreamwizards Games: The inaugural Second Edition Washington, DC Regional (that wasn't technically in Washington, DC) attracted 16 players, which was the second largest attendance this year. Lots of players travelled in for this tournament, with nine earning an achievement for playing in a new region. 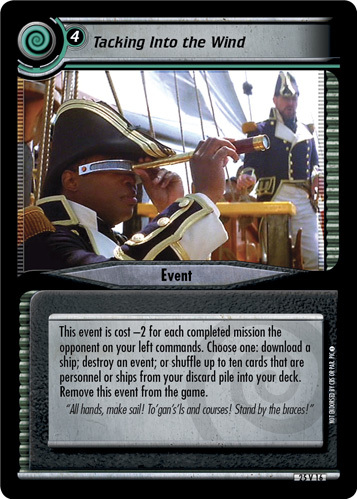 Neil Timmons (ntimmons) was playing a Borg deck titled "Go ahead try and stop me. See how well that works". He gambled that he wouldn't face any kill dilemma piles, and he built his deck to unstop personnel. This tactic seems to have worked, as Neil was the only undefeated player after six rounds. While this was Neil's first Regional title of the year, it was his ninth in the Continuing Committee-era. John Corbett (KillerB), playing a Bajoran deck titled "Fire and Blood" was runner-up, having suffered just one loss - to Neil. 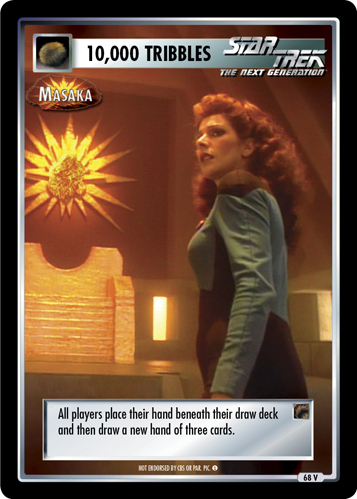 Only four players have played Bajoran before John this Regional season, but their combined performance sees Bajorans the top ranked affiliation when it comes to victory points scored at Regional tournaments. Brian Sykes (Armus), playing an Earth Space 9 deck titled "The Regulator - Mark II", led the group of four players with two losses in third place. Phil Schrader (pschrader), playing a Ferengi deck titled "The Exchequer adapted from Tyler", was fourth. Depending upon the adoption status of Brian Sykes; Team Jersey finished with either six of the top seven players, or all seven of the top players. They certainly know what they're doing! There were eight different affiliations played at this tournament, with Next Generation the most popular (played four times), and Earth Space 9 just behind it (played three times.) Ten deck lists and three tournament reports can be found on the tournament results page. Arby's Restaurant (Second Edition): This Andoria double-header attracted twelve players for the Second Edition Regional. Over four rounds, Kevin Jaeger (Hoss-Drone), playing a Dominion / Klingon dilemma avoidance deck titled "The Dominion Will......buy the gamma quadrant", came out undefeated to win the title. This was his second Regional title this year, and his sixth in the Continuing Committee-era. Kevin had the hardest route to a title possible; with his four opponents finishing in second, third, fourth and fifth places when the dust settled. Kris Sonsteby (LORE), playing a Klingon deck titled "Fear and Wonder... a Powerful Combination"; finished as runner-up - extending his run, where he missed out on the title by one game, to four consecutive Regionals. Reigning World Champion Mike Harrington (Ajnaran), playing a Next Generation deck titled "Field Studies Envoy", was third; and Shawn Colson (rengar) finished in fourth place, playing a Voyager deck titled "The Million Dollar Voyager". Nine deck lists and two tournament reports can be found on the tournament results page. Arby's Restaurant (Tribbles): Following the Second Edition Regional, eight players were joined by one more player to contest a Tribbles Regional title. The first heat was dominated by Kris Sonsteby (LORE), playing a Discard deck titled "Actually, I'm Not Even Mad... That's Amazing! ver 3.0". Kris scored 42% of the Tribbles scored by all five players at the table, and finished 540,291 Tribbles ahead of Mike Harrington (Ajnaran), in second place. The second heat was similarly dominated by one player. Ben Johnson (mindmage), playing a Poison deck titled "Ben's poisonous ND Regional deck, by M. Hayes", scored 724,951 Tribbles - just over 70% of all Tribbles scored at the table. Ben was so dominant that none of the other players from his heat made the final table. It consisted of him and four players from the heat one. The final table saw Kris Sonsteby make use of Tally and Utilize to take the title, just over 200,000 Tribbles ahead of Shawn Colson (rengar) in the runners-up spot. Six deck lists and one tournament report can be found on the tournament results page, and an interview with Kris Sonsteby is below. The Pommeler's Rest: Four players participated in this Block Draft First Edition Omarion Nebula Regional. With two Federation decks, one Ferengi deck and one Klingon deck; the Federation players should have been at a disadvantage, but some excellent defensive drafting by James Hoskin (RedDwarf) evened things up a little. James went on to win all three of his games, and take this First Edition title - his first in the 17 years he has been playing the game. The highlight of the tournament happened in the third round, when James faced Paul Fosten (TF_Loki). Both were playing Federation and, as a consequence, had five duplicated missions. This meant the missions averaged eight dilemmas seeded beneath each of them, and mission attempts were very rough. All except for one, that is; where James and Paul both seeded the exact same three-dilemma combo. Paul found that one, and ended up solving the mission. James had to work his way through something like 20 dilemmas at three missions to win the game. He's not bitter about that at all. Three deck lists and one tournament report can be found on the tournament results page. West Coast Sports Cards: This First Edition Ferenginar Regional attracted eight players; including Reigning World Champion Jeremy Commandeur (Commandeur), and the top ranked First Edition player in the world Kenneth Tufts (Worf Son of Mogh). They faced each other in the final round; where Ken, playing a Hirogen deck titled "YaaM dose not Kill the DQ", was victorious. This was Ken's third Regional win, and his fourteenth tournament win this year. Jason Drake (Wambundu), playing a Federation deck titled "Collective Delusions", lost just one game and finished as runner-up; while Jeremy was third, playing a Klingon deck. It should be noted that all eight players used different affiliations at this tournament. If that's not worthy of an achievement, I don't know what is. Six deck lists and three tournament reports can be found on the tournament results page. This week, Kris Sonsteby (LORE); the ninth fastest Tribbles breeder in the world, winner of the Tribbles portion of the Andoria Regional double header in Fargo, and fellow writer; fields my probing questions. James: Let's start with the Second Edition Regional, what decks were you considering playing? Kris: Over the past two years or so, I've been mapping out what I am going to play in specific events well in advance. This Regional season was no different, as I lined up Klingons for the Minnesota Regional to take advantage of our area's current anti-Federation & cost-based dilemma pile meta, and Original Series for the Manitoba Regional to take advantage of their relative inexperience against kill piles. Both of those choices seem good in hindsight but, unfortunately, left me only back burner ideas for the North Dakota Regional. Ideas such as Cadets or Maquis, that I had previously tested during our league playoffs. However, after pulling all of the affiliation data out of the six Regionals that occurred in my area, and breaking down the numbers on what was winning or doing well, I was left to wrestle with the notion that I would effectively be running uphill if I chose to pilot any Federation deck, especially Next Generation. As pre-registration of high-caliber players grew, ultimately I opted to call an audible rather than try to buck the trends against what ended up being a pretty condensed field (i.e. 50% of the participants carrying 1600+ ratings.) Once I made that choice, I turned to long-time ally Matt Frid, who suggested I pair one build's dilemma pile with the other's draw deck to form what we dubbed the "Plan B" Regional design. Kris: Following the casual 'trek Thursday Nerd Night event I hosted (which incidentally degenerated quickly into a Tribbles marathon), I expected to see several players attempting to shoot the same anti-Federation & cost-based dilemma pile angle I had at MinnMania, earlier in the season. While, to this day, I seem to be the only Klingon player in our area; squaring off against Romulan, Cardassian, or one of Kev's crazy multiple HQ builds all seemed probable. James: You were only one win away from winning with your Klingon deck in Minnesota. What changes did you make to the deck before taking it up to North Dakota? Kris: Since I was literally two Strength short of going undefeated at MinnMania, I knew I shouldn't change much, but at least had to swap out a couple of verbs if I wanted to pair it with the 20-card kill pile I've been using. So, I banked on not seeing kill piles myself and dropped the Genetronic Treatment, dumped the third D-7 Battlecruiser in favor of a second copy of Uninvited, and turned J'Dan (a.k.a. The Maintenance Man) into Nu'Daq, who proved to be a game changer. The dilemma pile is also totally different as, for the first time in ages, I wasn't tag teaming my death machine with a Federation design. With hardly any events, I ditched the two 8-costers in favor of an Unfair Terms and new favorite Programmed Compulsion. I turned the Infinite Diversity into an Unwanted Guests to take advantage of the distinct lack of Honor and Law I expected to see in most of my opponent’s builds; and I swapped the Shocking Betrayal out for The Caretaker's "Guests", before going to war. James: Can you describe how your Klingon deck works? Kris: The decklist is here. K.Ri.S. is a culmination of countless revisions, but the basic premise is to exploit the garden variety random stop and choice stop attrition piles that are prevalent across the globe. Gowron and Relentless are crucial for that, with Klag and Riker as backup against An Issue of Trust and heavy skill piles, respectively. Typically, I'm out attempting turn three or turn four, constantly swinging back and forth between Qo'noS, Rescue Prisoners, and Investigate Alien Probe. Once the space mission is completed, the game clock gets significantly shortened by the arrival of The Sword of Kahless. I'll mop up Rescue Prisoners in short order, before power bombing Brute Force with Riker, Kahmis and a group of scrubs or a four-man All-Star Team consisting of Bolt Face (a.k.a. Chang), Gowron, Gorkon, Korax, and/or a few members of the Blood Oath trio, all of whom will have 10 strength. James: Are there any special tricks in the deck? Kris: Not really. It has countless ways to skate around or bust through dilemmas and is really tough to stop on the ground once the attribute bonus from the sword kicks in. That said, I've felt for a long time that the sum is greater than the parts with this particular design, as my storied experience with it usually grants me the ability to focus that much more on my opponent's strategy. I will also say though that all the design has ever lacked over the years was: event destruction, a way to download a ship if it wasn't drawn; and/or a way to reset if too many people were pitched with Mara or killed. Tacking into the Wind took care of all three issues. Kris: Honestly, everyone I played was a tough matchup. As my tournament report states, I could have lost every game I played last Saturday, and probably should have dropped two or more in light of the fact that all of my opponents seemingly rose to the occasion. Chris just ran out of Biology, Nat just ran out of bonus points, Kev drew perfectly when he needed to, and Steve just ran out of range. But, after playing with all of these guys for years, I've come to expect nothing less from the combatants that make up The Land of 10,000 Champions. Kris: The kill pile would have to go; while it did alright at keeping my opponents in check, The Clown: Guillotine isn't reliably killing two personnel any longer, I'm not de-staffing ships at all, and it more or less runs out of steam after four or five attempts. Plus, those verb slots are just too important to burn up with copies of Uninvited, which more often than not were forcibly pitched with Relentless. James: Moving onto Tribbles, you've run and played in a lot of tournaments recently. Had you figured out which was your best deck, or did you just go into the Regional hoping for the best? James: Can you tell us how your deck works? Kris: Ideally, you go out before your opponents. [laughs] Seriously, or as seriously as I can take this question, the hope is to exploit Discard as liberally as you can, collect Tally points whenever you get hit with Toxin, and use Masaka either offensively to ditch a big hand or defensively to prevent other players from going out. James: Discard seems a risky strategy, given that Toxin is such a powerful counter to it. Were you concerned about Toxin? Or did you have a strategy for playing around it? Kris: Ha! Sorry, but my inner child has to chuckle at the thought of being "concerned" about cards with over-sized hairballs on them. To your question though, Toxin can be nasty, especially when you go from one card in hand to six or more, but Tally (a.k.a. the money comes to money Tribble) is your friend since you split the points, then likely Masaka yourself right back into a position to win. James: How did the tournament play out? Kris: The short answer is I ran like gawd. The long answer is, I did it over all ten rounds counting the prelims, with the day's turning point being a 10,000 Masaka into a 1 Go, 10 Go, 100 Stampede and out on my next turn that propelled me from the middle of the pack into a commanding lead and ultimately onto the finals. James: In those finals, who do you think was your main challenger? Kris: Steve for sure, as his Rescue / Battle deck routinely puts up huge numbers in all our locals. However, Shawn was also one to watch out for as his Poison deck could catch me if he went out a few times and hit enough copies of Tally, since at that point he knew to Poison me exclusively without fear of having me spike an Antidote. Kris: I wouldn't; since nabbing the Discard victor Achievement, I have already trashed the build and moved on to my next cycle of Tribbles Achievement goals. Someone's got to catch Matt Hayes, it might as well me be! Kris: Yeah... I feel compelled to break kayfabe a bit and point out that with the Road to Worlds article series' third year now winding down, I hope everyone reading this recognizes how much work goes into it and gives you the credit that you deserve. After pinch hitting for you once last year and now being a 3-peat interviewee, I'm probably the only person who realizes how thankless and time consuming a job it is, and have certainly enjoyed every minute I've spent both collaborating on and reading the print versions that have come out this year. Thanks for taking the time to answer these questions, Kris. Congratulations to all players, and I wish better luck to anyone who didn't make it this time. These bye winners have been added to the list of current bye winners for the Continental Championships and the World Championships here. There were 18 players at three First Edition tournaments this week, taking the total players at First Edition Regional Championships to 125 - an average of 6.0 players per tournament. 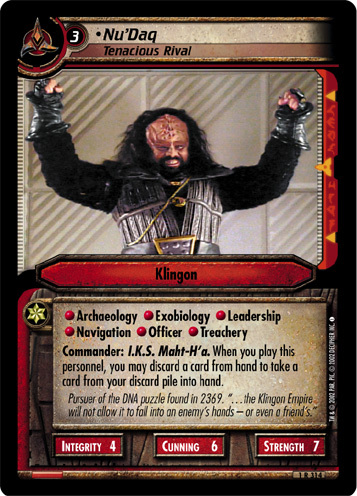 With two block tournaments, Federation, Ferengi and Klingon decks were popular again. Dominion, Kazon, Klingon/Cardassian Alliance and Vidiian have yet to be played at a Regional this year. The best performing First Edition affiliations to date are Bajoran, averaging 10.6 victory points per tournament; Hirogen, averaging 10.0 victory points; followed by Starfleet, averaging 9.7 victory points. The worst performing affiliations are unchanged again this week. The worst are Terran Empire, averaging 6.0 victory points per tournament; followed by Non-Aligned, averaging 6.8 victory points; and then Borg, averaging 7.0 victory points. There were 28 players at two Second Edition tournaments this week, taking the total players at Second Edition Regional Championships to 261 - an average of 7.7 players per tournament. The most popular affiliation this week was Next Generation (played six times), followed by four other affiliations played three times. Perhaps the most surprising omission is that the second most popular affiliation, Original Series, was not played at all. The best performing Second Edition affiliations to date are Bajoran, averaging 12.6 victory points per tournament; followed by Voyager/Equinox, averaging 12.5 victory points; and then Earth Space 9, averaging 12.2 victory points. The worst performing affiliations are Non-Aligned, averaging 8.7 victory points per tournament; followed by Dominion, averaging 9.7 victory points; and then Deep Space 9, averaging 10.0 victory points. There were 17 players at two Tribbles tournaments this week, taking the total players at Tribbles Regional Championships is 143 - an average of 6.5 players per tournament. Excluding preliminary heats, a total of 41,020,147 Tribbles have been scored to date, an average of 286,854 Tribbles per player. This week, I managed two correct predictions, Kris managed one, and Mike Nugent (Iron Mike) became the fourth public predictor to get every prediction incorrect. It's clearly not as easy as it looks. As a result of having more chances to break that duck than the other three players, Mike joins at the foot of the table. There are just six Regionals to go now, and with just four predictions between myself, Kris and the public; anyone could still win. This week's interviewee, Kris Sonsteby (LORE), has nominated another player to make the prediction, saying "As much as I'd like to swerve the public votes by picking Daryle Humperwinkle to win next week, I'm going to tag in The Original Champion, my Money, Inc. running mate, for this one. Take it away, Mr. Matthew Frid (bandana8472)." CVJM Kassel e.V. : This Vandros IV Second Edition Regional is the warm-up for the 2012 German National Championships on Sunday. It has been the Nationals warm-up for the last two years, with between twelve and 15 players participating. Based on those two tournaments and current pre-registrations, there appears to be two contenders: 2011 winner Tobias Rausmann (garetjax) and 2010 winner (and tournament director) Thomas Schneider (thsch). Both already have one Regional win under their belts this year. Tobias has five wins from eleven tournaments, a 45% winning record. He just about edges out Thomas, who has two wins from five tournaments, a 40% winning record. In the head-to-head, they have played 29, with Tobias winning 18 and Thomas winning eleven games. The numbers are all pointing toward Tobias, but my gut says Thomas will beat him this year. Thomas to win. Kris: Tobias Rausmann to win. Why? Since unveiling his new running forearm finisher, The Total Package has laid out every opponent he's faced. As a former World's Heavyweight Champion and now reigning Regional Champion, I gotta believe the man's fully recovered and ready to make a return to "The Family," Gorilla. Matthew: Tobias Rausmann to win, because the public vote is fuelled by what's in the public domain. I was severely let down by the fact that none of the other pre-registered players have posted a tournament report all year. Heck, some of them have never even posted a deck list. At least Tobias has a plethora of good decks posted for each affiliation. 2011, won by Tobias Rausmann (garetjax) playing Deep Space 9. 2010, won by Thomas Schneider (thsch) playing Borg. A review of the one result from week 12, an interview with a winning player, more statistics, and a preview of final five Regional Championships of the year.